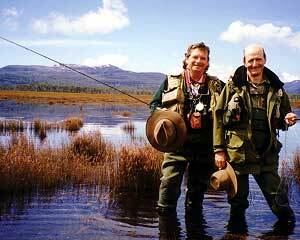 Tasmania & it's Fishery - Orrsome Tassie Trout. Tasmania with its clean, green image, vast World Heritage listed areas and national parks, is deservedly the world's best temperate island, as voted by readers of Conde Nast Magazine in 2000 and 2001. Tasmania produces the very best cheese, meats, fruits, vegetables and seafood found in Australia, as well as fine wines. However, it is Tasmania's small population of less than half a million and its three thousand wilderness lakes and small streams, ideal for fly fishing, that make it the "Montana" of Australia. An abundance of water, wild brown trout, mayfly hatches, beetle falls and daylight hours enable fly-fishing for wild browns from early August until the end of April. Ken and his guides offer a variety of fishing for each client varying the days between shallow lake margin stalking to wind lane fishing to the seclusion of meandering meadowland streams, No two days are spent on the same water so your Tasmanian fishing experience is diverse, fulfilling and a continuous learning curve. We offer river and stream fish ing throughout the season. Using a variety of locations around the state, anglers can experience everything from the subtle ceanid feeders to the bulging emerging mayfly feeders or the crashing wallop of the grasshopper seeker. The fish vary from location to location but can range from an aggressive halfpound wild brown to a cart-wheeling five pounder. Size can be unimportant when you get the perfect drift on a difficult run, just being there and mastering stream-craft can be the reward in itself. Join Ken and the team to unravel the secrets of Tasmania's rivers, streams, lagoons and lakes. There are still a few places left in the world that are ideal for wild brown trout fishing and Tasmania is such a place, offering unique, fascinating fauna and flora to compliment the total Tasmanian experience. We are an island like no other. This is a guide only and will be weather dependant for hatches or falls, and will vary slightly according to fishing elevation.